Out and about running errands over the last few weeks I've been surprised by the number of cacti embellishments that I've seen. On clothing, on bedding, on home decor...cacti seem to be very popular at the moment. 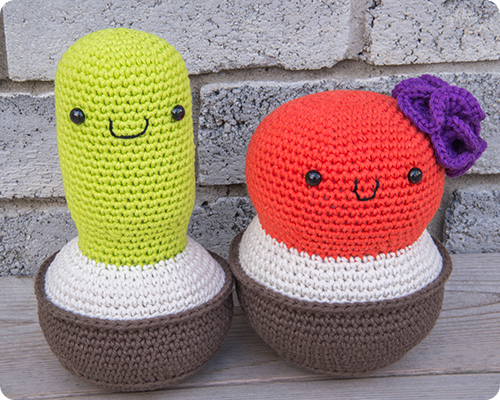 Of course, this inspired me to march myself home, rummage through my cotton stash for suitable colors, and crochet a few cacti of my own: Mr. and Mrs. Cactus. I've affectionately named these two Arthur and Bernadette. I've always loved cacti. When I was a little girl, I had a cactus garden in my bedroom and when Steve and I were first married, we bought a fun cactus we named "Yo" to put in our living room. All these cacti died, likely from over-watering, which thankfully will not happen to these two. With no little parts to sew on, these friends were very simple to make. 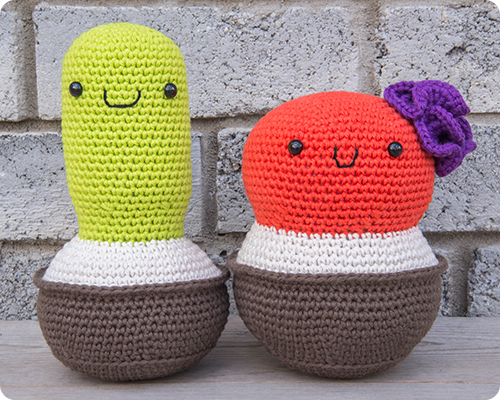 The pattern I followed is from the book Amigurumi World: Seriously Cute Crochet, one of my all time favorite amigurumi books....so many cute and adorable patterns inside. And I just realized something, remember my succulents in an elephant, and my little succulent in a tiny pot? Well, apparently I was already on the bandwagon because these are the third and fourth cacti/succulents that I have made in the last while. So fun!